Chinese Dragons are legendary creatures in Chinese mythology and folklore, portrayed with a long, scaled serpentine body and four legs. They are one of the most popular of Chinese art motifs. They appear in literature, songs, paintings, architecture and in many other aspects of Chinese consciousness. The origin of the Chinese dragon is not clear. 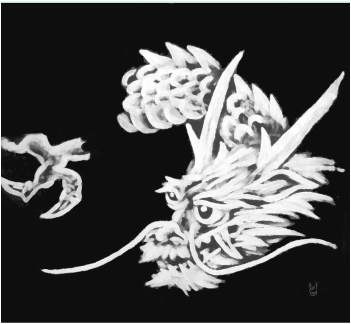 The presence of dragons within the Chinese culture goes back thousands of years. Some scholars believe that the Chinese dragon form originated from totems of different tribes in China. In a myth relating to Yellow Emperor(*), he originally used a snake for his coat of arms. Then, every time he conquered another tribe, he incorporated his defeated enemy's emblem into his own coat of arms. This story explains how the dragon came to have features of various different animals.